"Malecón Barroco" -- translated as "Baroque Seafront" -- is in many ways illustrative of Fabelo's baroque vision, though not in its grisaille color effects. 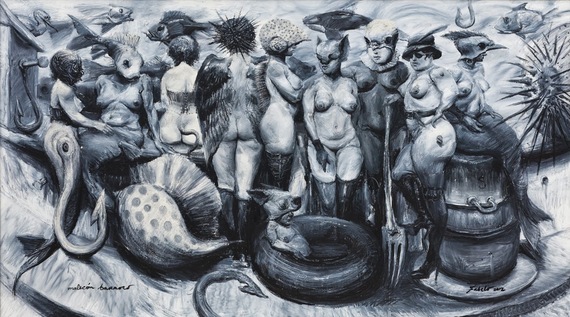 The crowding of the canvas with naked, buxom female forms, the carnival masks, in this case mostly marine in reference, the ornate busy-ness of the composition -- and, too, the darker side of the baroque vision, the spikes, fork tines and hooks, the satanic tails and barbs that contrast the exuberant celebration of lively sensuality with the adumbration of sinfulness, damnation, and death. There's both Peter Paul Rubens in this image, and Hieronymus Bosch. 66 ¾ x 89 ½ in. 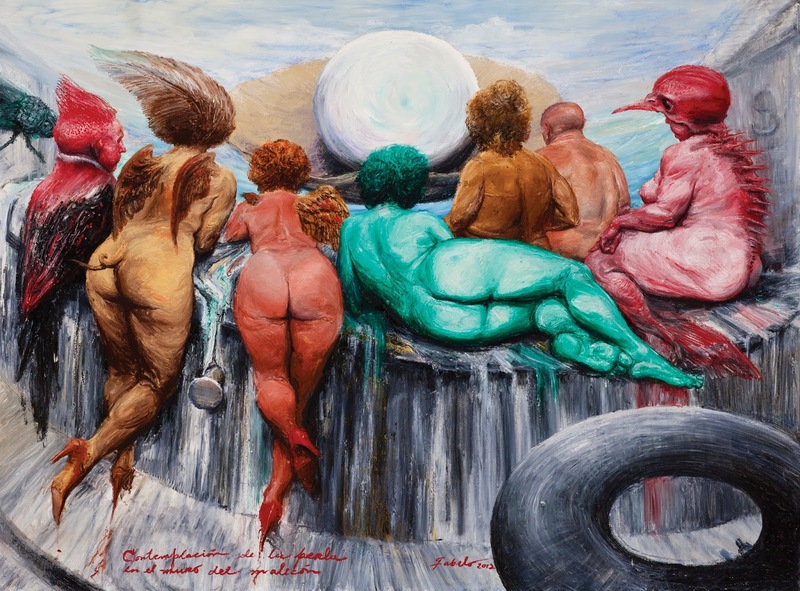 ... set, similarly, on a sea wall, the women are depicted in an array of improbable, glowing color, their bodies full, sensual, and presented with clear sexual invitation -- though adorned, again, with angel wings, fish spines or feathers. Accompanied by what appears to be a single male figure -- the artist, perhaps? -- they contemplate the pearl of perfection that looms, Magritte-like, before them on an oyster shell. Their quasi-religious adoration of this object is disturbed not only by the enormous bug that encroaches upon their space from the left side of the canvas, but by the incongruous rubber tire in the foreground, the heavy nail that violently pieces the wall, and the effusions, seemingly from their bodies, that ooze down the wall onto the sidewalk. 6 ½ x 9 ¾ in. And I see Fabelo's work essentially as an exploration of that psyche, the life of the human mind and its persistent struggle between its light side and its dark. The intimacy and the passion his work exude -- along with the unambiguously autobiographical revelations that pop up surprisingly in the drawings here and there -- suggests that it is the artist's own inner desires and demons he explores. That the paintings speak so compellingly to us as viewers suggests that we all share his obsessions at some deep level of the mind: we recognize ourselves in them. Paradoxically, we use masks to both reveal and hide aspects of our true nature: to hide them, obviously, for fear of what others might see and how they might judge us if they really knew; and to reveal, because we also nurture the perverse compulsion to be known by others for who we are. Fabelo models this work for us with passion and unsparing honesty. And it is "work." Without seeming in any way labored, both paintings and drawings reveal the intensity of physical labor and attention that went into their creation. The infinite complexity of their composition and the intricate, untiring exploration of their motif and themes are witness to a critical, highly conscious mind at work, even as it delves so boldly into the underworld of the unconscious. There's an authenticity that glows through all the surrealistic conceit in Fabelo's work, disarming potential accusations of cynicism or misogyny. Behind it all we might hear the haunted--haunting--voice of the 19th century French poet, Charles Baudelaire, in the final line of the poem that introduces his reader to Les Fleurs du mal: "Hypocrite lecteur, mon semblable, mon frère..." Fabelo makes us complicit in both his nightmare and his dream. 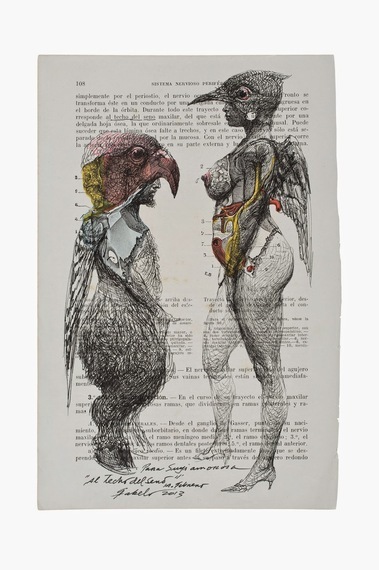 Note: Couturier Gallery in Los Angeles will be hosting a Roberto Fabelo exhibition September 13 through October 18 this year.